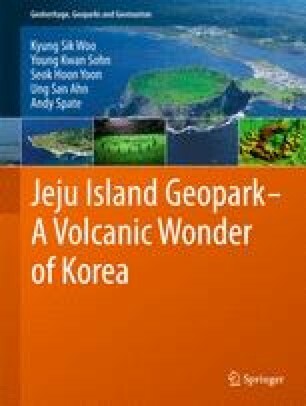 Jeju Island is a volcanic island situated off the southern coast of the Korean Peninsula. The island was produced by volcanic activity which occurred from about 2 million years ago until historic times. The island is 73 km long in the east-west direction and 31 km long in the north-south direction, having an area of 1,847 km2. The island has the typical morphology of a shield volcano, characterized by an overall gentle topography and an elliptical shape in plan elongated in the ENE direction.